Cómpeta is a town and municipality in the comarca of Axarquía, and province of Málaga, part of the autonomous community of Andalusia in southern Spain. The municipality is situated approximately 20 kilometres from the coast (Costa del Sol), and 52 kilometres from Málaga, the provincial capital. It takes approximately one hour to reach the village from Málaga Airport, along the coastal motorway and then inland via the well maintained mountain road. The town is also reachable by public transportation. Se transportation details at the bottom of this page. A tour of the centre of the town is indispensable. Here the traditional architecture proudly shows off one of its most charming aspects, which is the higgledy-piggledy way the houses are built. Some of them still have "semisótanos" (half-basements) where tools and other items are stored. The town’s most notable building is the Nuestra Señora de la Asunción church, which was built in the sixteenth century and later restored. The church’s exterior had to be rebuilt after the earthquake of 1884, but the most remarkable thing about this masonry structure is its four-level neo-Mudéjar tower (1935). In its interior is the outstanding mural of the Asunción de la Virgen (Assumption of the Virgin), a 1972 work by the Vélez artist Francisco Hernández. The town also has two chapels, San Antón and San Sebastián, both from the eighteenth century, are faithful examples of the religious and traditional construction styles of their time. Cómpeta's patron saint is the christian saint and martyr 'San Sebastian'. During the last weekend in July, Cómpeta celebrates its patron saint by holding a fair. On the 15th August of every year (Assumption Day), Cómpeta celebrates the 'Noche del Vino' ('night of the wine') which features a program of flamenco and sevillana music and dance, plus plenty of free-flowing vino. Apparently, the locals reputedly refer the sweeter wines, while the foreign residents and tourists like the dry. The 'Night of the Wine' is a very old traditional party which has been celebrated for a long time. Traditionally the inhabitants of Cómpeta went to their cortijos (farmhouses) up in the mountains during the vintage and did not return until October, when the raisins were packed and the grapes had been pressed. On August the 15th they met at Plaza Almijara for a farewell party, where they sang and danced fandangos and drank the famous local wine. The main product of Cómpeta is wine. Therefore there is an interesting wine museum in the village. It sells different types of local produce and handicrafts, as well as doubling as a bar and restaurant. Other local specialties include almonds, honey and olives. Cómpeta is situated in a particularly beautiful and mountainous area with vineyards, lemon fruits, avocados and olive trees. There are countless networks of small, public paths called "caminos" within this partially cultivated area. The mountain peasants and their mules have made these small paths after several hundred years of use. But there are also several small paths in amongst all of the small, white, mountain towns to be found in this area. If you zoom in on Google Maps, you can see these small paths represented as light colored lines snaking their way around in the landscape. This can be useful when you are hiking and want to take advantage of these small caminos. The town has a great deal of entertainment to offer, including music in the square in the evening, a discotheque, flamenco dancing and a large number of restaurants and bars. There is a large public indoor swimming pool in the town and this is converted into a large outdoor pool during the summer months. By patronizing Hotel Balcon`s cafe/restaurant, you will have free access to use their pool. They also have a tennis court for renting. The village is composed of the traditional pretty white town houses with narrow geranium strewn streets and has all the amenities you could possibly want, including a large heated swimming pool, a tourist office, restaurants, bars, banks, supermarkets, etc. Cómpeta has a population of approximately 3,900 residents and the natives are called competeños. It is situated at 638 metres above sea level in the foothills of La Maroma (the highest peak of the Sierra Tejeda). Cómpeta's has over 300 days of sunshine a year and is blessed with an average temperature of 18ºC. Press here for the Official Cómpeta Turist Website. Press here for the Official Cómpeta Town Website. Cómpeta also offers a wide variety of leisure activities and sport. The surrounding area is also a fantastic area to explore in a car. There are many small white villages in the area; each with its own character. The coast is reached in just 25 minutes by car. There is a local bus that drives 2-3 times a day to the coast/beach and continues into Malaga. Go to the bottom of this page for more info. This is a municipality that, like so many others of the province of Málaga, has no documented history until the fifteenth century. But considering the characteristics of the territory-abundant water, mountain refuges, pleasant temperatures and its status as a link between the provinces of Granada and Málaga, it seems probable that it contained human settlements in prehistoric times. The Cómpeta name is believed to have Roman origins. Its derives from the Latin phrase Compita-Orum, which means "crossing of roads". It was probably a place where the Romans held their feasts and offerings, as well as a place to shop and sell products. This is believed to be the town's origin, but there are no written documents to support it. Cómpeta appears by name in written records for the first time in 1487, when the magistrate of Vélez-Málaga, which by then was in the hands of the Christians, urged the local Muslim inhabitants to submit to the new Christians owners. The town must have been no more than a small farming and trading community. The Moors were resistant, but Christian troops overcame the last Moorish resistance on 12 June 1569. The town was practically abandoned by the Moors and was repopulated by long-time Christians from Puente Genil, Estepa, Baena, Seville and other towns that had already been taken back from the Moors. The document from the first marriage contracted between established Christians in the town is preserved in the parish church. The year was 1573. Less than a 30 minute drive from Spain’s most southern point; Cómpeta enjoys a dry Mediterranean climate that still guarantees genuine Spanish tradition. Situated in a surrounding of mountains; the small town of Cómpeta generates one of the most extravagant inner-city enclaves of the Malagaregion. Cómpeta features an unrivalled natural environment, including its beautiful valleys that are set in the Sierra AlmijaraNational Park; are assured to amaze any visitor that comes its way. Even though Cómpeta is located approximately 650m above sea; due to its location in the southern end of Spain, the region experiences a temperate and vigorous climate that sees many travellers from all over Europe. With its locality a comparative distance from the ocean allows Cómpeta to enjoy moderate average temperatures throughout the entire time of winter. As Cómpeta is located at the foot of the Sierra Almijara; the mountainous region typically snow capped throughout the majority of the year is positioned between Malaga and Granada stretching down onto the warm Mediterranean. Even though not a coastal destination; the area of Cómpeta enjoys some of Europe’s finest weather. Although quite a dry region the area takes pleasure in benefits of an extraordinary micro climate; Cómpeta is outstanding and around the district travellers are bound to see a profusion of various fruit trees and magnificent vibrant vegetation and plant life. Spring throughout all southern areas of Spain is particularly pleasant; assuring an extensive quantity of sunshine hours and warm temperatures. Spring in Cómpeta will typically experience high temperatures of 24ºC and minimum temperatures of 10ºC from March to May. In comparison to all Spanish coastal resorts; rainfall throughout this time is very minimal. However, to Cómpeta’s standards it is relatively normal, experiencing an averages of 35 mm per month. Summer throughout the Cómpeta region is exceptionally enjoyable, and is a great time to escape the scorching temperatures of the humid coastal beach resorts. Average climates during the summertime see temperatures as high as 33ºC during the day but will tend to cool down by night to a soothing 15ºC. Precipitation during the summer months is very sparse and throughout June and July is basically non-existent. Autumn is also a very pleasing time in Cómpeta; as the surroundings of the town see the last blossom fall to the ground. With average temperatures only a few degrees higher than the spring, rainfall, similarly to the summertime is still very minimal. Winter in Cómpeta can at times seem a lot milder than the coastal resorts of Spain. Even though in close proximity to the Sierra Almijara mountain range; which throughout the winter is guaranteed to be full of vivid snow, Cómpeta’s average climates can almost be assured to stay above freezing point. Precipitation throughout the course of winter is also at its highest; averaging near 100 mm per month. If you rent or have a car, just follow Bing Map instructions. Cómpeta is about one hour driving distance from Málaga airport. Click the map picture below to open Bing Maps. Note: 'Calle de Picasso' and 'Avenida de Torrox' are not on Google Maps. But you can find them on Bing Maps (above). It is possible to hire a local Cómpeta driver and car. It is also possible to arrange transportation to and from the airport. This will cost about 65 € per way. If you want to arrange this, please inform the house owner. If you are driving into Cómpeta by car, then head towards 'Plaza de la Vendimia' via the Cómpeta road 'Avenida de Torrox'. Below is the view you would see about 100 meters from the Plaza. 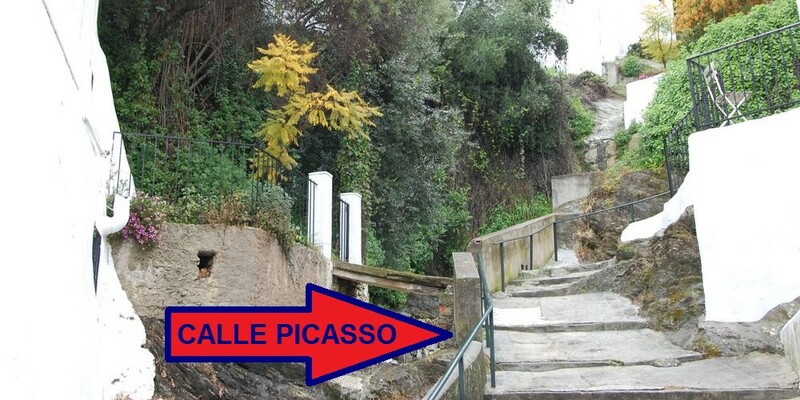 From this point you can walk down the public pedestrian street 'Calle de Picasso' where the house is located. On the picture you can see 'Calle de Picasso' starting just behind the walking lady and fence. This is just a 15 meters away from the front door. Calle de Picasso 5, E-29754 Cómpeta, Spain. 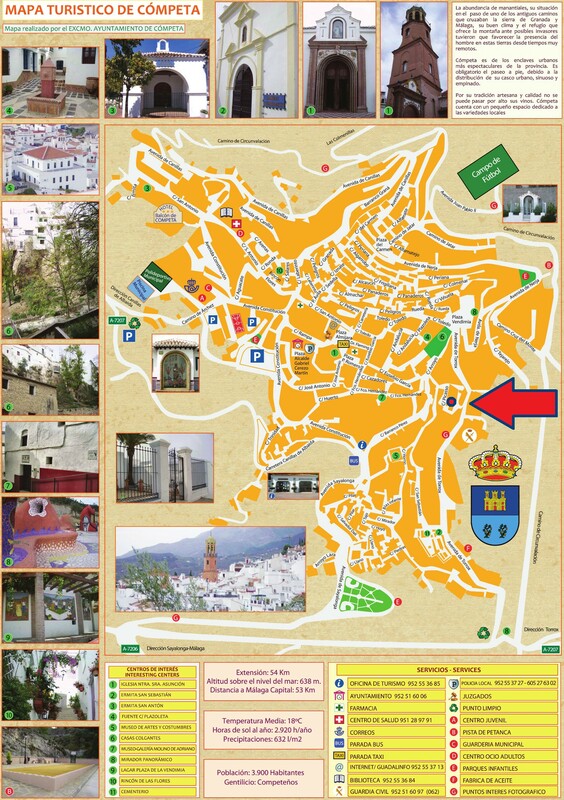 Park your car on 'Avenida de Torrox' road or at 'Plaza de la Vendimia' about 100 meters further down the road. If you are on a budget, travel light, and you are well at planning trips, then you can think about traveling by train and bus. Take the C-1 train (Fuengirola - Málaga Centro Alamenda) from the airport to the 'Málaga Maria Zambrano' station - the last stop before the 'Málaga Centro Alamenda' end station. The train runs every 20 minutes and you can buy ticket in the vending machine at the airport. From 'Málaga Maria Zambrano' you can take a bus all the way to Cómpeta. The bus station is right beside the train station, on the other side of the street. The bus only departs 2-3 times a day, so be sure to plan your trip carefully. Alternately you can stay overnight at a hotel in Málaga. Málaga - Torre del Mar - Algarrobo - Sayalonga - Cómpeta - Canillas. Click here for the time schedule. 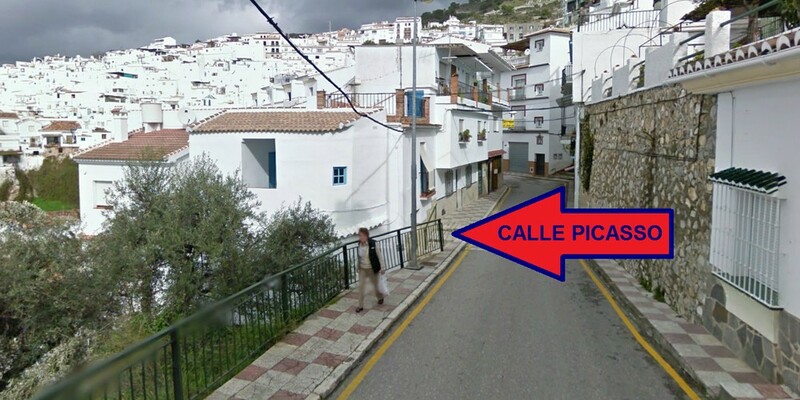 If you arrive in Cómpeta at the Bus Stop / Tourist Information Office, then just head up 'Calle de Barranco Pérez' road to the right of the Office. Walk 150 meters and keep right. After turning right you will see some stairs going up. This is the other end of 'Calle de Picasso'.